Whether you’re talking about food, culture, or history, there’s one thing you can always say about Dubai: it has layers. Dubai is home to more than 200 nationalities, each bringing with them their own culture and food. The city is famous for its sparkling hotels and luxury restaurants, but beneath all the glitz and glamour is a rich current of history and culture that influences every aspect of the city’s life. When it comes to food, Dubai of course has a cosmopolitan restaurant scene with internationally renowned chefs from all over the world. But it also has a wonderful culinary tradition of its own, drawn from the ancient and diverse Emirati culture, that is carried on by street vendors as well as fine-dining establishments. In dining as in everything else, if you want a proper understanding of this unique city you have to experience it from multiple angles. Nearly every street corner in Dubai will have a restaurant selling shawarma, pita sandwiches with slow-cooked meat, vegetables, and a variety of dressings. 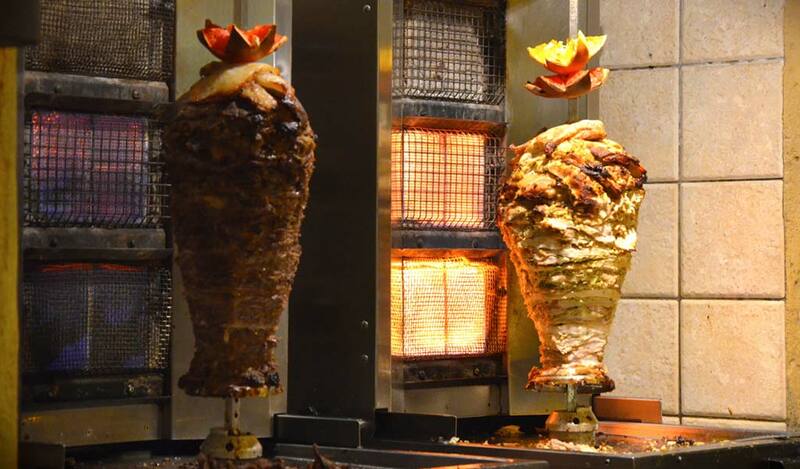 Shawarma is wildly popular across the Middle East (and increasingly so in Europe, Asia, and the United States), and is one of the best cheap options for travellers on a budget who want to experience an authentic treat from the Arabian Peninsula. You’ll also be able to find shawarma in the distinctive Lebanese and Iranian styles, and get a feel for how the distinct and various cultures of the Middle East all share an unmistakable family resemblance. If you’re lucky, you may also find harees, an indigenous dish that looks a bit like hummus, but is made from wheat, pureed meat, and spices. Depending on the exact combination of spices used, harees can be subtle and delicate or (more commonly) extremely rich and aromatic. It’s especially popular in the evenings during the holy month of Ramadan, when many Muslim families gather to break their day-long fast with the satisfying flavors of home-cooked harees. According to a 10th-century cookbook, the medieval Caliphs used to eat a version of this dish that is almost exactly the same as that served in Dubai today; so when you try harees for the first time, think of the 1,000-year history behind this delicacy of Kings. Of course, travelers to Dubai can also find a modern luxury dining experience around every corner. This includes everything from Japanese sushi bars to Brazilian steakhouses, but it also includes a growing number of restaurants that focus on bringing a modern culinary flair to traditional Emirati dishes. Many entrepreneurs are collecting their grandparents’ traditional recipes and hiring top chefs to prepare them. The same scents of cardamom and garlic that have always defined the region’s cuisine are now weaving their way into the stainless-steel kitchens of 21st-century luxury restaurants. But one of the best ways to truly immerse yourself in Dubai’s culinary heritage is to take your meal into the desert. Just like the Bedouin who have wandered Arabia’s deserts for thousands of years, you can experience what it’s like to eat at a traditional desert camp under the stars. 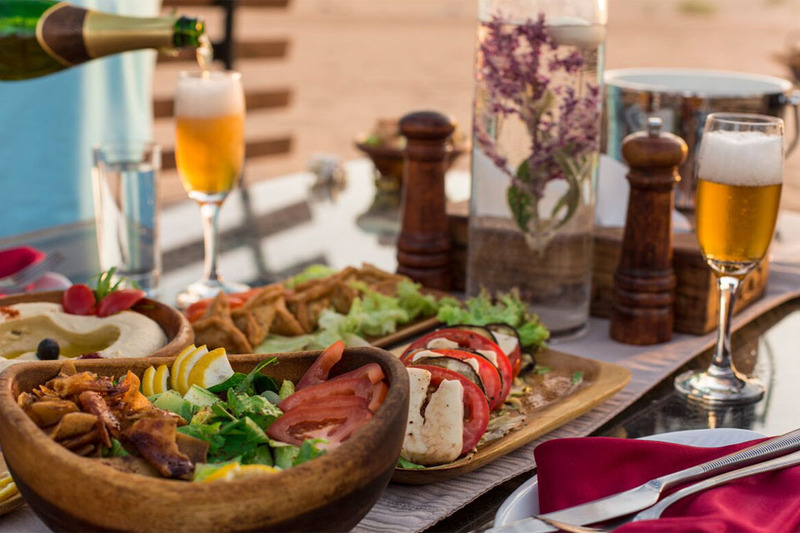 Platinum Heritage offers a particularly sumptuous desert feast which combines authentic cultural demonstrations (camel rides, henna tattoos, and traditional falconry) with a spectacular meal prepared and served at camp. The tour is available in both a Platinum version and a Heritage version. Platinum focuses on a fine dining experience with a six course dinner and includes numerous options for visitors of all tastes; Heritage is less extravagant and elaborate, but just as delicious. It also include an authentic camel-meat dish that is difficult to find in restaurants. Platinum Heritage, more than any other tour company in Dubai, focuses on authenticity and, as our name suggests, heritage. This is expressed not just in the wide variety of Emirati cultural practices that our Guests enjoy, but also in our mission to preserve the cultural heritage of the UAE. We employ local guides and source our ingredients from local suppliers to support their communities; and all our tours emphasize sustainability and reduced environmental impact so that this magnificent natural and cultural heritage can be preserved for all future generations.